The earth is a cylindrical drum whose height is one third it width (DK 12A10, cf. DK 12A11). 1. The earth lies in the middle, based on an argument from sufficient reason (DK 12A1,12A23, etc.). 2. The earth is spherical (DK 12A1). 5. The moon and the sun are like cart wheels and are atilt (DK 12A22). 6. The circle of the sun is twenty-seven-times (text here may be missing) of the moon (text here may be missing) (DK 12A11). 7. The sun is highest, and the circle of the fixed stars is lowest (DK A 11). 8. The sun is highest, after which is the moon, and under them the fixed stars and planets (as also hold Metrodoros of Chios and Crates) (DK 12A18). 9. The moon is a circle nineteen-times the earth (DK 12A22). 10. The sun is a circle twenty-eight-times the earth, that the apeture which lights up is equal to the earth in size (DK 12A21). 11. The sun is a circle twenty-seven times the earth (DK 12A21). 12. The sun is equal to the earth (DK 12A21, cf. DK 12A1). With the exception of (2) and (6), these claims may be readily reconciled. (6) probably involves a textual error, while (2), from Diogenes Laertius is likely to be an authorial mistake. The mention of planets in (8) could easily apply only to Crates or to Crates and Metrodoros. Anaximander may well have regarded the moon and sun as cylindrical bellows or cavities whose shape and size are the same as that of the earth (diameter thrice the height). The width of the circles would seem to be either the same as the height of the earth's cylinder or the diameter of the earth. It is also unclear whether the circles are multiples of the earth's height or its diameter. Thus, one side of the moon will be eighteen-times the earth, and the other side will be nineteen-times. So too, the inner side of the circle of the sun will be twenty-seven-times the earth and the outer will be twenty-eight times. Our sources do not provide the size of the circle of the stars, but a sequence, 1 (height of earth), 3 (diameter of earth), 9-10 (stars), 18-19 (moon), 27-28 (sun), seems reasonable. Also possible is a sequence which takes the diameter of the earth as basic, 1 (height of earth), 3 (diameter of earth), 27-30 (stars), 54-57 (moon), 81-84 (sun). However, on this view it is more difficult to explain the size of the moon and the sun. Nonetheless, this is hardly a conclusive objection in view of the paucity of the evidence. The traditional view takes the sphere of the stars as spherical, something like this. However, there is no reason to believe this. Hence, a sphere is not necessarily the most natural model. Recently, some have suggested that the stars are on a cylinder. There are several ways of thinking about this version. It might be that Anaximander thought the cylinder was infinite with the ecliptic atilt to the cylinder of the stars, or that it was infinite but not atilt. On this view, there will even be stars near the north pole, if very far from the earth. 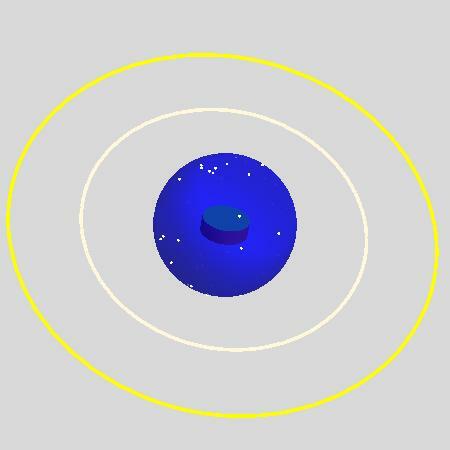 Similarly, the cylinder might have been finite with the ecliptic atilt (initial diagram), again, whether the moon and sun are atilt to it or with them not atilt. In particular, in the sixth century B.C.E., there would not have been a star at the pole of rotation of the celestial sphere (none less than Mag 6 within 2 of the pole, and none less than 4 within 6 ), so that the lack of stars would support the model. Did Anaximander know of the ecliptic? Probably not. However, he would certainly have known that the sun and moon have different risings and settings in the course of the year and month, respectively. Perhaps we should not expect too much consistency precision in this very thin account. For example, if the circles are fiery, but only appear to us because of vents, how do we manage to see the sun and the moon. Also are these two atilt? One important suggestion has been that for Anaximander the sun and moon move up and down the cylinder in the course of the year and zodiacal month, respectively. In this movie, as on any reconstruction, the band of the fixed stars, sun, and moon, move with their own single rotation, the stars 364 times per year, the sun's band 365 times per year, with the moon's band once every 29 1/2 rotations of the sun. This gives the appearance of the stars revolving around the earth once per year in relation to, e.g., western horizon just after sunset. The conception of the motions as merely coordinated is largely replaced in the late fifth century by a model that takes the daily motion of the fixed stars as fundamental and produces other motions by geometrical combinations of motions. Yet, the older view survives among the atomists and even has its supporters into the Renaissance. The daily motion on this interpretation will look like this (with the waning moon slightly gibbous). The model will account for the variation in the positions of the moon and sun, north and south at risings and settings, and different distances from the zenith at noon. Some of the questions above may not be solved, but it is not reasonable to demand that the model work perfectly. A different question arises, however. The rotation of the bands derives from the rotation of the initial seed. Why do they oscillate up and down? Does any this conflict with the principle of sufficient reason that establishes the stability of the earth? Cf. Dirk Couprie, "The Visualization of Anaximander's Astronomy," Apeiron 28 (1995): 159-181; Robert Hahn, Anaximander and the Architects (Stony Brook: SUNY Press, 2001); Gabor Betegh, "Le problème des représentations visuelles dans la cosmologie présocratique: pour une histoire de la modélisation," in A. Laks-C. Louguet (edd.) Les Présocratiques (Lille, 2002), 381-415.